With the Scaldis bottle capping machines you can close bottles with screw on and press on caps. . This automatic capping machine with a stainless steel frame is very user-friendly. Some options are cap presence control, cap alignment control and a rotating operator panel. The TRG is a stand-alone machine used to tighten pumps and triggers. The operator puts the pump/trigger in the bottle and positions it. The bottle brake positions the bottle and holds it tight. The closing head consists of 4 wheels: 2 loose ones and 2 servo-controlled ones. These serve to tighten the trigger/pump with the required screwing torque. The TRG module can also be integrated in capper models. 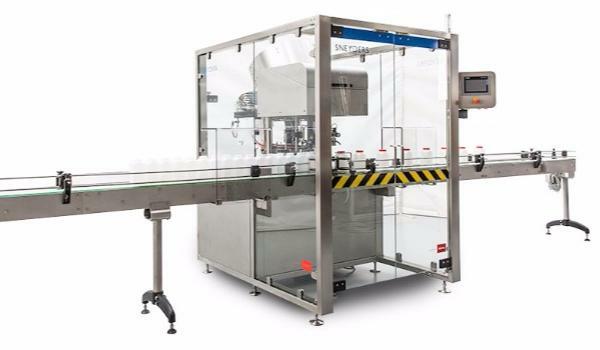 Would you like more information about the Scaldis bottle capping machines or do you want to know how your company can benefit from this machine? Contact our specialists for professional advice.